"The 40th Precinct, or as it's known to police, the 4-0, is a 2-square-mile area at the southern tip of the Bronx. Across New York City, homicides plummeted to 333 in 2014, the lowest since comparable statistics started to be kept a half-century ago. The 40th Precinct, though, remains one of a few areas where homicide has persisted. To understand how and why murder lives on in a city that has seen crime fall to historic lows, the @nytimes is examining every homicide in this section of the Bronx, starting with Carmen Torres-Gonzalez's killing last month. 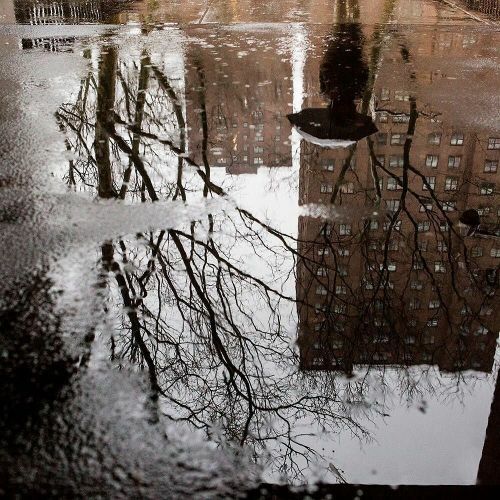 The photographer @kirstenluce took this photo of the Mott Haven Houses, as reflected in a puddle. Visit the link in our profile to read more about the first murder that's occurred this year in the 40th Precinct." By nytimes on Instagram.